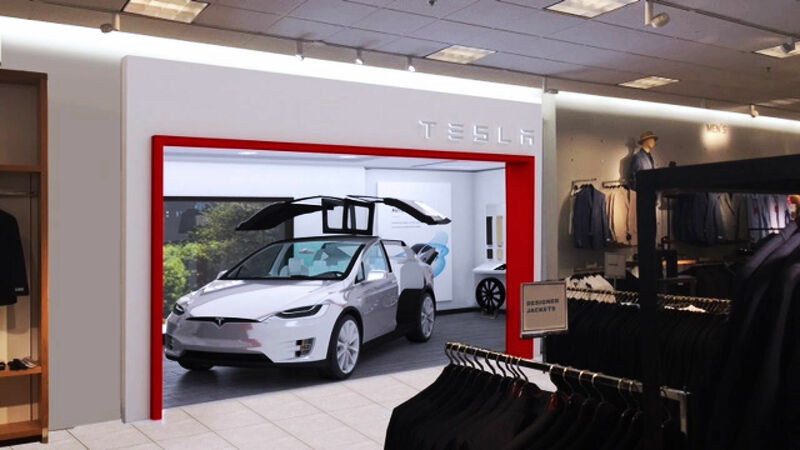 Last weekend, Tesla announced it will start a pilot program with upscale fashion retailer Nordstrom at their popular anchor store The Grove, Los Angeles, to let interested customers test drive one of their Model X with a Tesla representative on site. If the customer is interested in buying the vehicle, they will be redirected to the nearest Tesla sales associate who can further assist them with the purchase, or pointed to the company's website to order it directly. Nordstrom has 121 stores in the U.S. and Canada. By partnering up with them, Tesla is hoping - by obtaining a license to sell through Nordstrom - to circumvent decades-old franchise and car dealer laws in several states that essentially ban direct-to-consumer sales and force all cars to be sold through large dealerships. "This kind of innovation is just not going to be possible if we don’t have a direct sales model... Because ultimately we’re going to be restricted by the dealerships from engaging in the new playful ways that we’re able to do because we own our business." said Tesla's VP of North American Sales, Ganesh Srivats. Srivats was a former executive at fashion brand Burberry and worked extensively with Nordstrom in the past, he now heads the pilot program. Adding "[We're] bringing Nordstrom customers a Tesla experience, and I think for Nordstrom as well, it’s like, How can we target Tesla’s audience?" The Model X will be on display on site inside a 400 square foot boutique in the department until the end of the year when the two companies decide if they want to expand their partnership. "We're focused on listening to our customers and seeing how they respond to this type of differentiated experience," said Nordstrom is a statement to FastCompany.